In January we are challenged to use 17 (or more) buttons! Wow! That did prove to be a challenge. My layout is designed to remind me of my resolution to Get Moving every day. Another challenge was taking this photo of me walking in front of the camera. The neighbors probably think I've started some new fad exercise regimen if they glimpsed me doing little sprints in the driveway the other day. After I set the self timer, I would run in front of the camera trying to catch my feet at the perfect position. It is a wonder my knees didn't protest. For some reason I thought I had to halt abruptly as soon as the photo was taken. And I did this for 2 different days. The first day I was running in the opposite direction. When I started putting together the layout I realized in our left to right reading culture that it would look like I was running away from my goal - not toward it. Then there was the running part. Why did I need to 'run' in front of the camera? One of the best photos has both feet suspended off the pavement at once. Like that is going to happen! I'm not a runner. I walk, I hike (easy to moderate stuff) when I get the chance. So I settled on this one with at least one foot connecting with the ground. That's more like me. The color scheme came about because I wanted to use some sherbet colored buttons I got on sale at Hobby Lobby last year. They are pretty colors with great shapes and just aren't getting much use. At one point I almost abandoned them thinking the theme of this layout needing more commanding bright colors. However, I want this resolution to be something that blends into my day. I don't want the layout to SHOUT at me to do something all the time. I think the orange gives it enough of a kick. - or me enough of a kick. I cut the flourishes on the Cricut out of thin chipboard and pattern paper. I found it easier to place the buttons with the layout on the floor so I could get a good all over look at it. There are exactly 17 buttons at a LOT of glue dots! The layout is going in my new hinged album cover frame and up on the wall for motivation. I'll have a photo of that frame posted soon. Thanks for visiting with me today! I'd better get moving now and do some errands. Your layout is amazing! Loved your post telling the story how you did it! 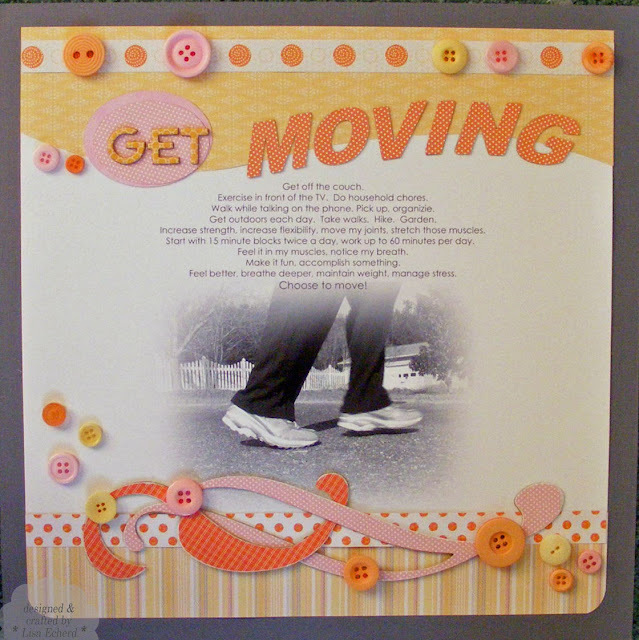 Like very much the color combo, with the flourish and the journaling! I have this resolution for 2011 too! Thanks so much for playing at Scrapbookers Anonymous! This is fantastic! I love the colors and the movement you created with the swirls and wavy paper. Now I know we're not the only ones who do "creative" things with the camera to get a shot! Thanks for playing along with us at Scrapbookers Anonymous! Awesome work Lisa!! Love the way you used your buttons and that picture looks great in black & white! So funny to read how this pic was taken... it really made me smile and so clever to walk from left to right!!! 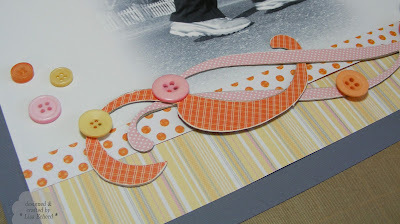 Thans soooo much for playing along with us at Scrapbookers Anonymous! Gorgeous LO and the colours are beautiful. Love how you've used the buttons and swirls together giving it movement. Great story about the photo,very funny. 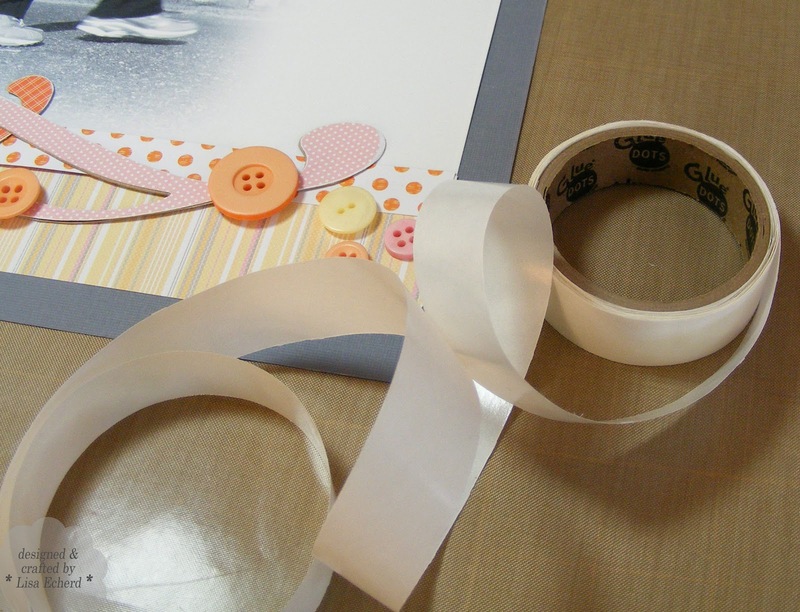 Thanks for joining us at Scrapbookers Anonymous. This is fantastic, very inspiring. Love the photo effect and very funny how you took the picture. Great use of all those buttons!!! Thanks for digging in your stash and joining in the fun at Scrapbookers Anonymous! Great job on those flourishes. Wonderfully bright and inspirational layout.